Canada's federal government is on track to return to budget surpluses a year earlier than previously forecast, Finance Minister Jim Flaherty said Friday. Speaking in front of the House finance committee, the finance minister also stressed the Conservative government will be "staying the course with our plan to make Canada a low tax jurisdiction for families and businesses," but said the government could change course if there were a "dramatic deterioration" in global economic circumstances. Flaherty said he expects federal finances to return to the surpluses by fiscal year 2014-2015, a year earlier than his previous forecast. The Conservatives had promised a return to surpluses by 2014-2015 in their election platform this spring, but backed off that promise a week after the election. Flaherty's comments suggested that projection is back on the table. "Our economic fundamentals are sound and sustainable," Flaherty said of the Canadian economy, noting the country has seen seven consecutive quarters of growth. But the finance minister noted "we should not understate the risk" posed to Canada by economic turmoil abroad. 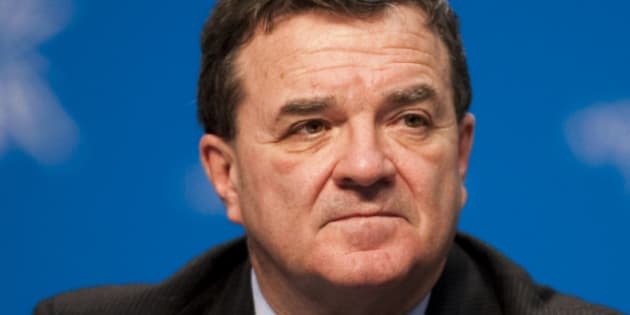 Flaherty's reiteration of the government's austerity plans brought criticism from opposition members of the finance committee, who suggested the government was being irresponsible by focusing on deficit reduction instead of job creation. NDP finance critic Peggy Nash asked the minister if the government would look to increase spending on such things as infrastructure projects to help offset the weak global economy. "Why not attack the jobs deficit? Why not create jobs that will keep the economy moving and also reducing the fiscal deficit through growth?" Nash asked the minister. But Flaherty rejected that argument, saying that "in the current environment (more spending) is actually a problem." He cited the U.S.'s budgetary problems as a cautionary example of "precisely the wrong direction to go." Flaherty sought to paint the government's position as moderate, noting that some "more right wing" economists have been arguing for steeper, "draconian" budget cuts, but his government does not plan to pursue that path. Flaherty also defended against opposition criticism of the Conservatives' decision to keep economists out of the economic update hearing. "We get lots of advice, we're open to listening," Flaherty said. "And frankly some of the best advice I've gotten over the past five years has been from private sector economists, and I welcome it." Asked about the government's plans in case of a global recession, Flaherty said the government was prepared to "protect Canadians" and shore up jobs should there be a "dramatic deterioration" in conditions in Europe or the United States. Mounting government debts in several European countries — including Greece, Italy and Spain — and the possibility that some could default on their payments have been worrying global investors. There are also fears that the slumping American economy will squeeze the Canadian economy and undermine the government's deficit-fighting plan. Flaherty said the current situation has been caused by a lack of confidence in efforts of governments to reduce their deficits. "We must address these global challenges decisively and commit now to fundamental medium-term reforms," he said.